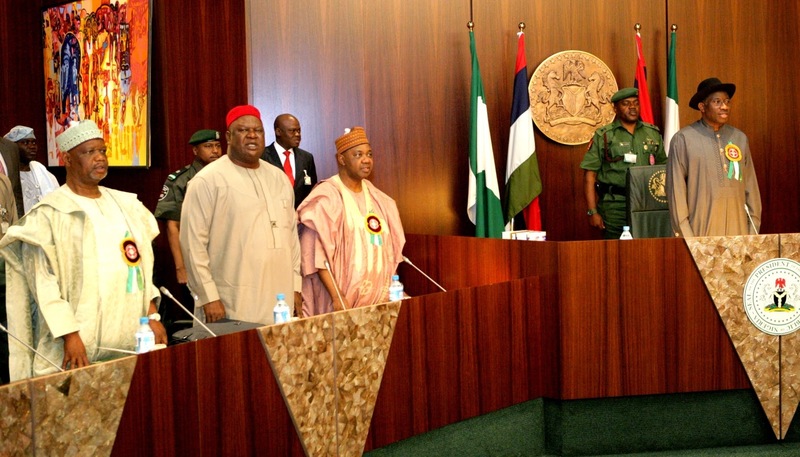 The Federal Executive Council in Nigeria has approved two new private universities. They are the Edwin Clerk University in Delta State and the Hezekia University in Umudim, Imo State. Also on Wednesday, President Goodluck Jonathan swore in two new Federal Commissioners to man the Civil Service and Federal Character Commissions. Briefing reporters after the council meeting, the Minister of Information Patricia Akwashiki and Minister of National Planning, Mr Abubakar Sulaiman, said that the Federal Government, under Goodluck Jonathan, is still fully in charge and would not tolerate any paralleled government by the incoming administration of General Mohammadu Buhari. The council meeting started with the swearing in of the two new commissioners, Ambassador Toye Olofuntoyi, who is the commissioner in the Civil Service Commission while Ambassador Abdullahi Shinkaffi is the Commissioner in the Federal Character Commission. The Federal Executive Council said it considered as uncharitable some of the utterances said to be coming from Buhari’s party as efforts are being made to ensure a smooth transition programme on May 29. The Council maintained that whatever was the outcome of the election should be in the national interest of Nigerians and how to enhance and promote it at all times.